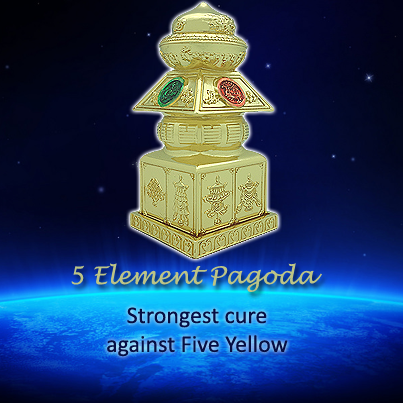 The Five Element Pagoda is undoubtedly a more favorable remedy against the Five Yellow when earth energy is stronger than usual in certain directions, years and period. The pagoda arrests, traps and locks up the harmful energies of earth element. The Five Element Pagoda always overide other ordinary cures in the current Period of 8 where the earth chi dominates the world for 20 years. This powerful cure is mantra enhanced to sought the assistance of "Cosmic Energies" to pulverize negative forces of the Five Yellow and clear blocked pathways paving you to a smoother and less aggravating year. Having great control over the cosmic elements, this pagoda wield its miraculous power, guard against loss of wealth, loss of career, loss of life and loss of health. Incredibly powerful, it wards off the terrible potential of fatality, accidents and bankruptcy. The Five Yellow is somehow responsible for tragedies striking a family when it afflicts the maindoor or a bedroom. Featured on the outside of the pagoda are 8 Auspicious Objects, 12 Sovereign Hexagrams, 4 Celestial Guardians, "Hidden" 8 Immortals and the Mantra of White Umbrella Goddess. Hidden inside the pagoda are "Hotu" pattern, a big rolling of multiple secret mantras, citrine chips and an energy infused scalar tag. In 2018, the north direction is afflicted with the Five Yellow. Extra precaution is required because another most deadly affliction, the "Three Killings" combine forces in the same direction. Also a year of double earth, the earth energy from the Five Yellow becomes more pronounced and easily dominates the north's water element. Therefore, other cures like "saltwater cure (or anrensui) will be unsuitable. 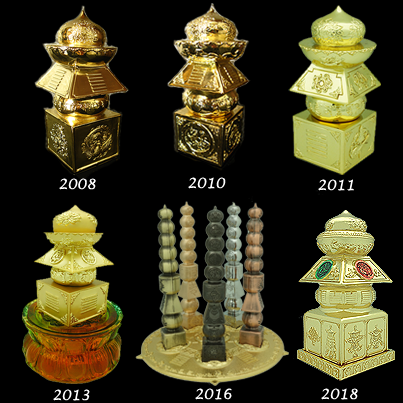 The Five Element Pagoda will be the most favorable cure for the north in 2018. 1.The 8 Auspicious Objects are an ultimate cure that serves to generate good energy, subdues bad energy and nourishes the "chi" of a space so that good fortune continues to grow esponentially. It is also a potent cure for extremely bad situation where other feng shui cures are considered not strong enough to counter a problem. Therefore in situations where the #5 Yellow becomes stronger than usual, this is the secret weapon that will subdue it powerfully. 2. The 4 Celestial Guardians provide directional guardiance to evil energies coming from the four cardinal directions. They are the green dragon, white tiger, black tortoise and red phoenix. Known as the protectors of four directions, they provide safety blessings and prevent dangers from hurting the household. They also hold the key to effectively balance weak or missing elements of a space when it goes out of sync, and thus remedying elemental conflicts and imbalances. 3. The 12 Sovereign Hexagrams transform negative energy into positive energy. These hexagrams are known as "feudal lords", while the remaining 48 hexagrams are the "subjects". They represent the essence of the I Ching hexagrams. These twelve hexagrams are linked to the twelve months of the year to create The Firing Times of the Greater Cycle the Sky - The Sun. These ultimate patterns activate the lunar and solar currents of the year. 4. The Mantra of White Umbrella Goddess - The powerful Buddha of Protection who carries a white umbrella has the power to symbolically dispel any evil intentions of people who may want to hurt you. Be mindful that everyone is vulnerable to jealous intentions of unscrupulous people, enemies or competitors, so it is better safe than to be sorry. This mantra can also ward off black spells casted by the underlying currents of jealousy and making them harmless. The mantra is "Tadyatha Om Anale Anale, Khasame Khasame Bhaire Bhaire, Sume Sume Sarva Buddha, Adhishthana Adhishtite Svaha" which can be recited 108 times a day. This is the most powerful mantra to diminish the strong evil 5 Yellow and subdue all kinds of dark forces. 5. The 8 Immortals Objects (known as "hidden eight immortals) represent the presence of Eight Immortals. The 8 Immortals catalyses divine powers to help bless one with positive energy, bring good health, good fortune, wealth, fame luck, longevity and good descendants. They dispel whatever obstacles arising from the Five Yellow. 6. As for the Hotu Pattern, ancient texts revealed that the Hotu pattern is a powerful antidote and provides the key to unlock many of the secrets of Flying Star feng shui problems. 7. Citrine Chips placed inside the pagoda represents the imprisonment of earth energy from the Five Yellow in the pagoda. a. Long Mantra of Medicine Buddha - Medicine Buddha has unbiased compassion for all. He protects everyone from physical and mental sickness and other dangers and obstacles, and helps them to eradicate the three poisons – attachment, hatred, and ignorance – which are the sources of all illness and danger. Medicine Buddha not only helps in healing but also for overcoming the inner sickness of attachment, hatred, and ignorance. Thus Medicine Buddha can help decrease physical and mental illness and suffering. The Medicine Buddha mantra is held to be extremely powerful for healing of physical illnesses and purification of negative karma. Anyone who is stricken by disease can seek blessings from Medicine Buddha for curing. b. Exalted Mantra King of Great Breath Mantra - it is believed that diseases are caused by the breath sent out by the great lord of all the spirits of all the three continents called Grinning Teeth (sekpa). All humans and spirits living in the world may contract various sicknesses and having their lives taken away once the destructive breath fills up the whole world and touches sentient beings. And it was revealed that the anecdote to the diseases is through the practising of this mantra called the "Exalted Mantra King of Great Breath". Whenever it is practised, sentiant beings will not be harmed by the breath. The mantra when worn or kept on ones neck, head or body will be protected against Ebola Virus and other contagious diseases, receiving no harm or sicknesses (tongney) from wind, bile, phlegm etc. c. Amitayus Mantra - To increase longevity, merit and wisdom and especially to clear the obstacle of untimely dealth. d. White Tara Mantra - To increase longevity, merit and wisdom and especially to clear the obstacle of untimely dealth. Note: The pagoda is energy infused and comes with a certificate of authenticity. The scalar tag has been sealed deep inside the pagoda at its upper level and is not visible. Made from noble material, this luxurious cure can effectively counter strong earth energy from Fatal #5 Yellow Star and Illness #2 Black Star. The inauspicious stars can either be in the form of "natal" chart's Water Star or Mountain Star or "annual" chart's Annual stars. However, please avoid placing them on the floor or inside the toilet since they invite divine help to vanish bad energies, illnesses, evil and killing forces. They can be displayed anywhere else, as long as they are above the floor level on a proper table, platform or cabinet in sectors that are afflicted with #5 or #2. If you have several levels in your home, you are required to place the same number of pagodas on each level depending on the area of each level. 1. Display it in the sector of the living room or home, bedroom, vicinity of main door or doors afflicted by annual #5 Yellow or #2 Black. These stars are especially more detrimental if the house is facing their directions. Eg. in 2017, #5 Yellow is in the north and #2 Black is in the west.